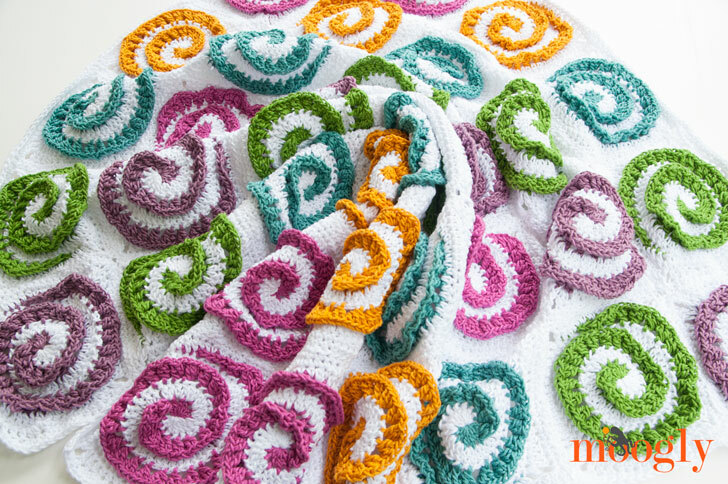 The Modern Rose Afghan is a gorgeous motif based blanket, that can be made in any size, and features gorgeous modern spirals that pop out in 3D for a floral impression that is modern and fun! It’s a wonderful balance between the floral and the graphic – for everyone to enjoy! 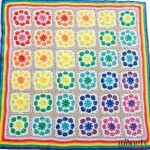 Each motif is 6″ square, so pictured here you see the baby size – 36″ x 36″. But of course you can make it any size you like – and I’ve provided some guidelines below! Using 2 skeins of the recommended yarn, I was able to make 8 squares – but save the odds and ends to sew them together and add the border! 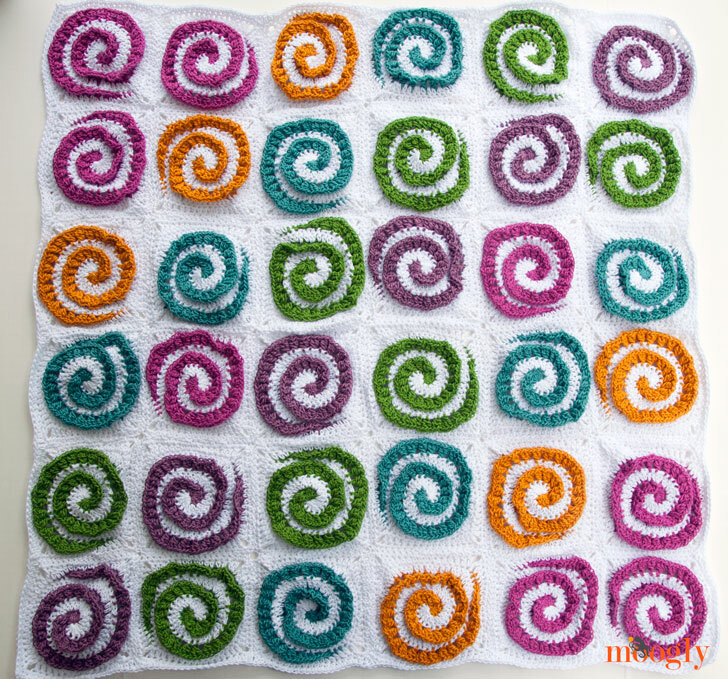 The 3D Spiral that’s added to each square creates a lot of movement in the blanket – the one photographed here has not been blocked. If you prefer a “calmer” look, you can block out each square and flower before joining. 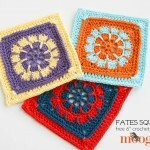 Or you might even find you like these motifs better without the 3D flower added – both ways are a great look! For the first 4 rounds, MC stitches are only worked into the CC stitches, and CC stitches are only worked into the MC stitches. The ch-1 between the dc sts are included in the stitch counts. The first 4 rounds of this pattern are worked as a two color spiral – there is no joining until the pattern indicates to join, and no chaining for height at the beginning of the first 4 rounds. Each round is written in 2 parts – the MC section, and the CC section. Use stitch markers to keep unused active loops open, and to mark the first stitch of each CC round. Video tutorials that may help are linked within the pattern. With CC, join with sc around top of post (as for a front post stitch) of last CC dc in Round 1, hdc, dc around same post, working toward the bottom of the post; then work 3 dc around next 36 CC dc sts, working from the top of the post to the bottom of the post each time; then work 2 dc around post of next CC st, 2 hdc around next CC st, sc around next CC st; break yarn and finish off. 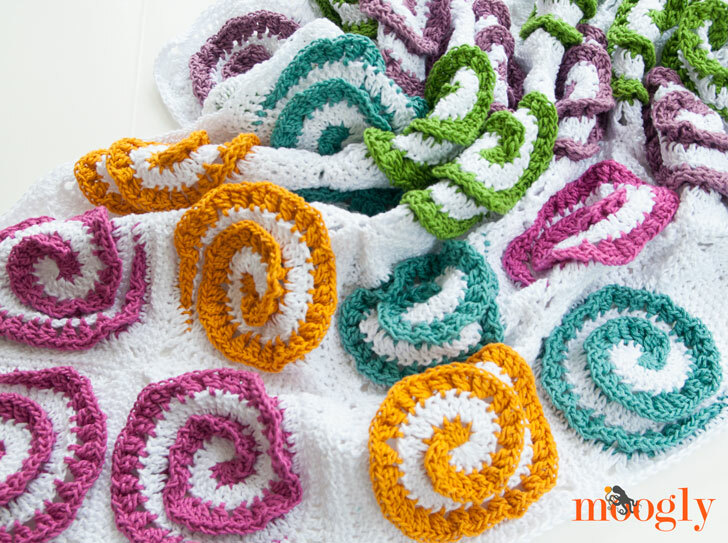 When sewing in these ends, use yarn needle to tack ends of 3D spiral down so they blend into the CC sts at either end. 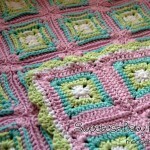 Assembly: Use the mattress stitch and leftover MC yarn to sew squares together (shown), or any joining technique you prefer. 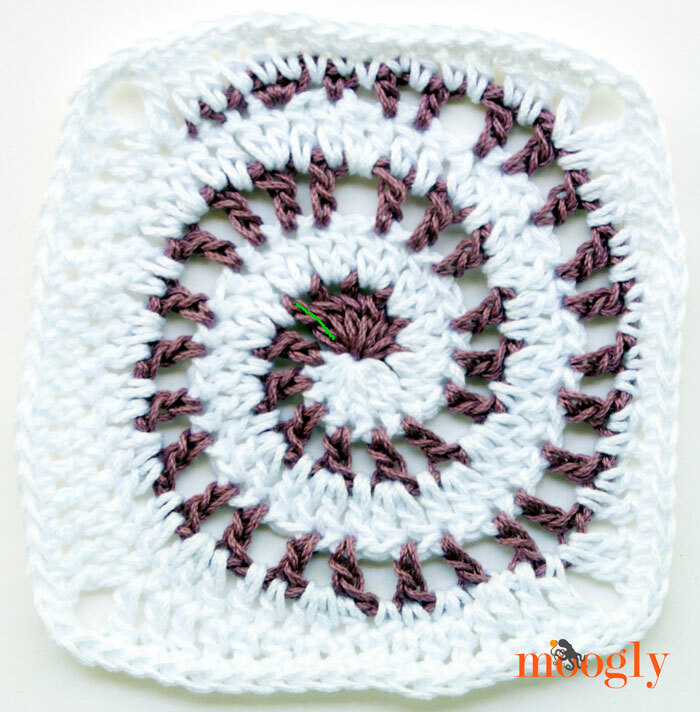 Shown is a simple MC edging – I really wanted the spirals to pop! But of course you can add any fun or fanciful borders you prefer! See the tips below. Of course, the great thing about motif style blankets is that you can make them any size you like! And that’s the Modern Rose Afghan! 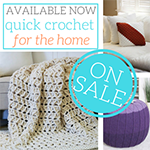 I hope you enjoy this fun free crochet afghan pattern – I’ve got a couple more ideas for these motifs that I hope to share in the future! I don’t think I have ever seen an Afghan with a motif that unusual. A very individual design indeed and looks like a fun challenge to crochet up. It looks like chenille to me! I love it! 😀 I’m getting that a lot – and I definitely see it! Thank you! What a beautiful blanket and a well written pattern. Thank you for the embedded videos. Thanks for the interesting pattern; I can visualize a very scrappy version, too. And an extra thanks for using Print Friendly, so I can easily save the page as a PDF. Hi Tamara, what a lovely and unique pattern. This rose is modern indeed. I am sure babies will find the colors and the 3D texture delightful. Thank you for the pattern. Definitely adding this to my to-do list. Have a lovely weekend. I’m not finding the 3D spiral video. The link posted goes to the wiggly video. Incredibly beautiful pattern!!! I absolute love it and can’t wait to stitch it up and make it my own. Thank you for your generosity in sharing. I love this pattern!! It is so unique and thanks for all the wonderful patterns. I have never seen one like this before. It is beautiful! There is no way I could pull this off but Im gonna give it a try! Thanks for sharing! I hope to make a video tutorial very soon, so that should help. 🙂 Thank you! Hi, this is such a cool pattern! I’m having trouble with round 3&4 though–when you say, “[ch 1, skip the next st, dc in the next st, ch 1, dc in the next st] 3 times; remove hook from loop. (18 sts)” with the CC in round 3, that’s only 12 stitches (not 18), so round 4’s MC pattern only has enough space for 2 repeats, not 3. Did I misread something? Whoops! I had a typo there, I will fix it now. I’m sorry AJ, thank you for bringing this to my attention! I would love an explanation of the abbreviations used as they are not the same ones I know…. Hi Karin! 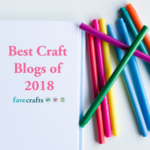 You can find them here: https://www.mooglyblog.com/crochet-abbreviations/ This pattern is in US terms, if you are used to UK terms that might be the difference. Yes, yes, yes………….this is the ONE! I’m finally a “Nana” to our precious six-week old granddaughter, whose middle name is “Rose” after my beloved grandmother. 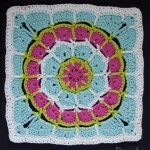 I’ve been searching for a rose motif afghan pattern, but something more abstract and modern. And here it is!!! Love this, and can’t wait to start! 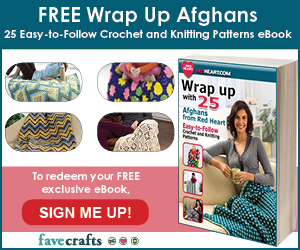 Thank you for creating such a beautiful afghan and sharing it with us. Oh my gosh! That is sort of kismet! 😀 Congratulations on the new granddaughter Juli!! 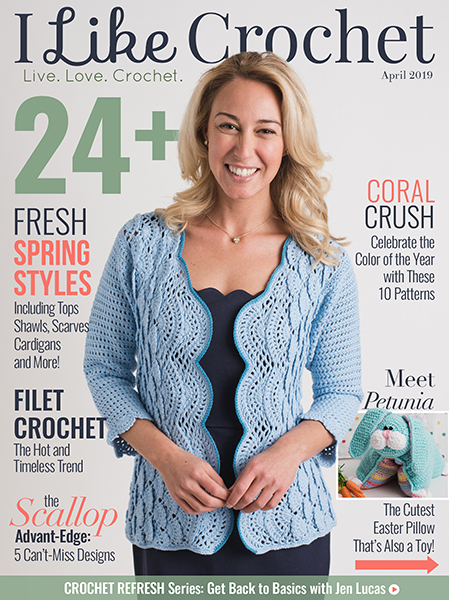 I would have to do all the contrasting colors in chenille …. and then touch it all night LOL. 😀 I’m so glad you like it Penny! I am left handed and am really struggling on the 6th round after 3rd corner. I watched and read, still not working. Help!! I’m sorry, I’m not sure how to help beyond the video. 🙁 It would be so much easier if it were all in person! I am curious how I would go about getting the 3D stitches with both colors. Any ideas? Hm. You could do a double layered rose, just one stitch on each post in one color, and then go behind it and do the same with the other? I haven’t tried it, but it might be worth playing with! My friends daughter is having a baby and I really would like to make this I’m curious about the yarn How did you like it would it be a good baby gift? Thank you Michele! It’s not as fuzzy as typical yarn, it’s more like a smooth cotton. But the overall effect is still soft, while being cool to the touch. Hi Vicki, and thank you! Black and white would look amazing! I’m sorry you’re having trouble! The sl sts are just referred to as “sts” in Round 6 and treated as such. Does that help? Seriously, you recommend a Furls hook? Yikes. I do love them, but I understand they aren’t for everybody! 🙂 Still, I like to share what I used. I agree with Vickis’s comment above, my friends and I do not understand how to crochet into a chain one space that does not exist when you get to the slip stitches in the contrast color. Nor do the main color stitches have chain one spaces. 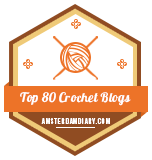 I’ve tried to crochet into each stitch, crochet between the stitches, even crochet into the previous round’s chain one spaces–none of these have brought me closer than four stitches away from CSDC. Please tell us how to proceed! Did you watch the video tutorial? I did try this amazing pattern and it looks just fabulous. I just wanted to ask , what did you mean by CSDC??!! Hi Penny! 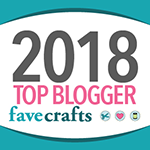 I believe I just sc around with the MC, but you could try reverse sc/crab stitch or twisted stitches (click here for tutorial), or maybe a polka dot edging (click here)? Thank you for the pattern for this beautiful piece of work! I have only done things for beginners but I have done lots of those. I shall try this. It is lovely! Thank you so much Shelby! I hope you enjoy it! Hi, Tamara 🙂 This pattern is unique and gorgeous! I knew as soon as I saw it that I had to make it. I bought all of my yarn last night. I am using a #4 worsted weight yarn in some beautiful colors! I will report back how it’s going once I get started. Thank you for this pattern. I am a blanket-making addict and was getting frustrated at trying to find some new and different patterns because I’ve made everything under the sun 🙂 This is different! I hope you enjoy it! 😀 Thank you! Hi! I started making this and then got bored making all the little squares, so I used them as border for a bunch of ;matching color c2c squares and it came out adorable. I would love to share the picture with you.